Units in our Alpine Wing have views of the magnificent mountains of South Canterbury, including Aoraki Mount Cook. All units are double-glazed for your peace and quiet. Studios feature spa baths, a kitchen corner with microwave and cook top, workstation, computer jack point and TV. Executive / family units feature fully equipped kitchen – including stove, dishwasher and fridge/freezer. They also feature a spa bath and shower, additional TV in master bedroom, balconies or courtyard, and will accommodate up to 6 persons. Our access unit, a twin, has been carefully designed to comply with regulations. Sauna unit with tea and coffee making facilities. Our Bay Wing contains 9 x 1-bedroom units. Each unit has views of Caroline Bay from the living room, and most have balconies and sea views. 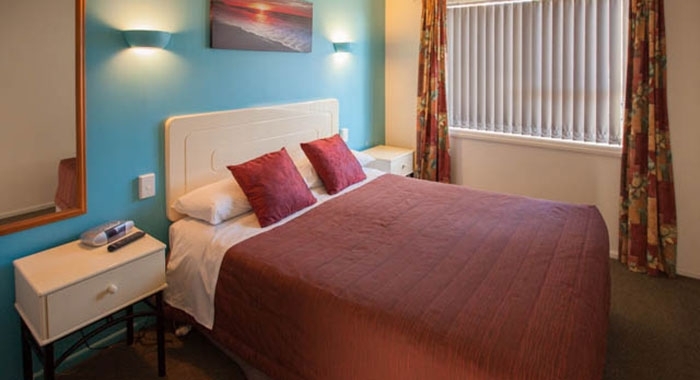 Facilities include microwaves, showers, phone, Sky TV and additional TV in the master bedroom, hair dryer, iron/ironing board, electric blanket and heating. Some units will accommodate up to 4 persons. The Superior Two Bedroom unit has been refurbished in April 2018. Large open plan dining and lounge is suitable for small meetings / interviews, with seating for 10-12 people. Internal Studio also available and can interconnect with Superior unit for larger groups. Spacious front facing unit overlooking Caroline Bay. With a full kitchen and ensuite shower. Room 1 has a King size bed and room 5 has a queen-size bed, free WiFi and flatscreen TV. Sleeps 2 people. Refurbished April 2018 ground floor family unit Main bedroom with king-size bed, second bedroom has 2 single beds. Open plan kitchen dining and lounge area, separate shower. Private courtyard, free WiFi, flatscreen TV. Sleeps 4 people. Main bedroom with queen-size bed and single, second bedroom has 2 single beds. Open plan kitchen dining and lounge area, spa bath and separate shower. Free WiFi, flatscreen TV. Sleeps 5 people. Sofa beds available at an additional cost. Please request room type directly with Motel. 1 x king bed, 1 x queen bed, bed settee in lounge. Fully self-contained apartment with views of Caroline Bay. Flatscreen TV with SKY channels. Private enclosed garage for parking. A fully self-contained upstairs apartment with a Queen and Single in both bedrooms. It has a large lounge with a 48"' TV, including 70 channels and heat pump/air conditioning. There is a great view of town from the lounge. Includes a fully equipped modern kitchen with a fridge/freezer and a microwave. Sleeps 6 people. A fully self-contained upstairs apartment with a Quuen and Single bed. It has a large lounge with a 48" TV, including 70 channels and a heat pump/air conditioning. Includes a fully equipped modern kitchen with a fridge/freezer and a microwave. Sleeps 3-4 people. A fully self-contained upstairs apartment with a queen-size bed in 1 bedroom, and a queen-size and single bed in the other bedroom. It has a large lounge with a 48" TV, including 70 channels and a heat pump/air conditioning. Includes a fully equipped modern kitchen with a fridge/freezer and a microwave. Sleeps 5 people. A fully self-contained downstairs apartment with a queen-size bed in 1 bedroom, and two single beds in the other bedroom. It has a large lounge with a 48" TV, including 70 channels and a heat pump/air conditioning. There is a view of town from the lounge. Includes a fully equipped modern kitchen with a fridge/freezer and a microwave. Sleeps 4 people. A fully self-contained downstairs apartment with a queen-size bed in 1 bedroom and 3 single beds in the other bedroom. It has a large lounge with a 48" TV, including 70 channels and a heat pump/air conditioning. Includes a fully equipped modern kitchen with a fridge/freezer and a microwave. Sleeps 5 people. A fully self-contained downstairs apartment with a queen-size bed in 1 bedroom, and 3 single beds in the other bedroom. It has a large lounge with a 48" TV, including 70 channels and a heat pump/air conditioning. Includes a fully equipped modern kitchen with a fridge/freezer and a microwave. Sleeps 5 people. Large 4 Bedroom house with off street parking. 3 Bedrooms upstairs, 1 downstairs and a Garage room. There are 2 bathrooms, 2 fridges, large lounge with 60" TV with SKY channels. There is a heat pump and a laundry with a dryer. Sleeps 13 people. Tariff: $200 for 1-2 persons sharing bed, extra person $25. Check-in/check-out: Check-in is available from 2pm on the day of arrival. Check-out is 10am on the day of departure. Early and late check-in and/or check-out by prior arrangement and can incur additional fees. Please arrange with office for key pick up and drop off instructions. Same day reservations: Please call 0800 10 33 10 to enquire or make a same day booking. Cancellation/refund policy: Cancellations up to 48 hours before the booked date incur no fee. Thereafter the deposit may be retained and the total amount for the booked accommodation may be charged. Special conditions apply to group quotations/reservations. All prices in NZ dollars and include GST.